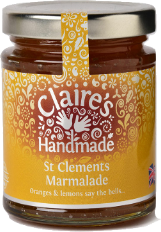 The perfect combination of sun-ripened Spanish oranges and lemons is brought together here in this brightly flavoured vibrant marmalade perfect on your breakfast toast. Add to your vinaigrette recipe to bring zesty freshness to your dressing. Allergens in CAPITALS. Sugar, bitter oranges 15%, lemons 15%, gelling agent: fruit pectin, acidity regulator: citric acid. Prepared with 30g fruit per 100g. Total sugar content 63g per 100g.